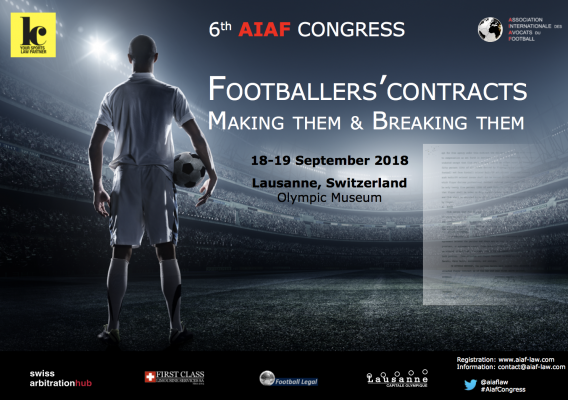 Kellerhals Carrard law firm will host the 6th edition of the International Association of Football Lawyers (AIAF) Annual Congress on 18-19 September 2018, at the Olympic Museum in Lausanne (Switzerland). The topic of the Congress is “Footballer's Contracts - Making them and Breaking them”. The format of the Congress consists entirely of round-table debates, featuring representatives from FIFA, UEFA, ECA, European Leagues, the Court of Arbitration for Sport, FIFPro and football law practitioners from around the world. Registration is open to members and non-members alike. For further details on the programme and speakers, please see here.